Families can be torn apart by accident or on purpose. 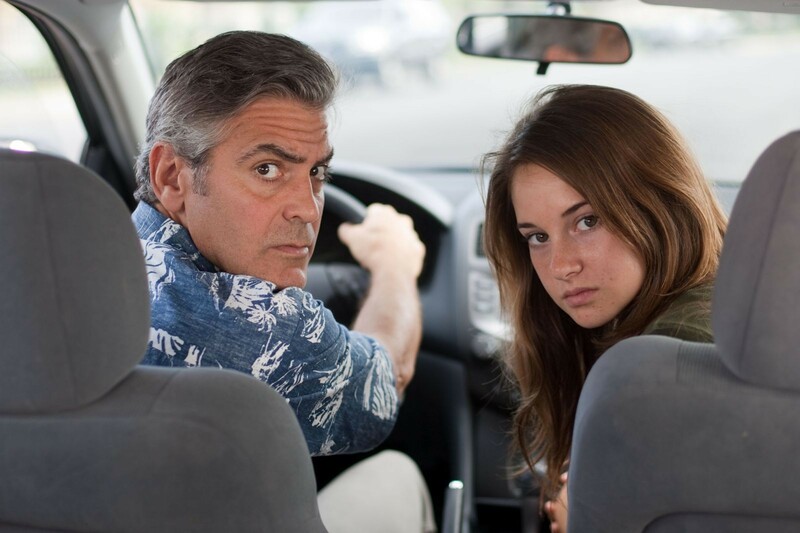 In the soulfully moving The Descendants, both calamities befall Matt King (George Clooney), and he needs to confront and pacify his tortured emotions while learning the basics of parenting to try and stitch together a family survival plan. Matt is a lawyer based in Hawaii, and the family trustee for a large and valuable piece of pristine real estate. Matt's life is knocked out of balance when his wife Elizabeth (Patricia Hastie) suffers severe head trauma in a boating accident and enters a coma from which she will not recover. Matt suddenly finds himself the sole parent of two girls. Ten year old Scottie (Amara Miller) is acting all bratty as a reaction to her mother being close to death. 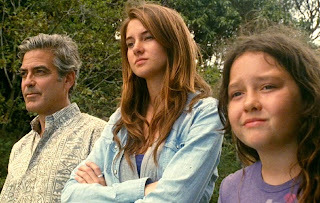 17 year old Alex (Shailene Woodley) has more significant reasons to be upset: just before the boating accident, Alex discovered that her mother was having an affair with real estate agent Brian Speer (Matthew Lillard). Alex brings in her laid-back friend Sid (Nick Krause) to help her cope, and he is inadvertently a stabilizing influence on the struggling family. Matt breaks the news of Elizabeth's impending death to her father Scott (Robert Forster), and tracks down Brian, whose wife Julie (Judy Greer) is the other victim of the affair. Despite losing a wife and a marriage, Matt must hold on to the remnants of his family and come to grips with a real estate transaction that will have far reaching consequences for his family and Hawaii as a whole. Every character in The Descendants is dealing with severe loss. Alex and Scottie are losing their mother and the facade of a happy marriage between their parents. Brian, once exposed, is in danger of losing his family and a big commission. Scott is losing his daughter to an accident and his wife to a disease. Julie is losing her marriage. Matt's cousins, who stand to benefit from the land sale, are in danger of losing the opportunity for a big pay day. Even Sid is suffering the after effects of his own family loss. Matt, at the centre of the maelstrom, is facing losses in every direction: losing his wife, suddenly realizing that he has already lost his marriage, fighting to avoid losing his daughters, losing the respect of his father-in-law, and about to lose his family heritage through a pressure sale. Matt will need to stumble his way out of a maze of sorrow to find a life that holds any remaining meaning, and The Descendants becomes a journey of salvation for a man who refuses to stop looking for life's fire escape. George Clooney is excellent as a father befuddled by what fate has decided to simultaneously dump on him, and ever so gradually rising to the challenge of making the difficult decisions required to retake control. Clooney is surrounded by a colourful supporting cast with some sharp edges. Shailene Woodley as Alex demonstrates some evolution to graduate from a rebel terrorizing her father to his greatest ally. It's a tender, if relatively jarring, transition. Judy Greer briefly - but memorably - appeared with Clooney in Three Kings. Her appearance in The Descendants is also relatively brief but most compelling, as the other injured party in a sordid affair. Greer conveys through her eyes a woman's instinct to sense the sharks moving in to kill her marriage long before she can see their beady eyes. The rest of the characters in The Descendants do their part in full Hawaiian shirts and sandals glory, Beau Bridges (as one of the cousins) and Robert Forster particularly dominant in their scenes but not bothering with any attempts at nuance. Director Alexander Payne, who allowed a seven year gap to pass since his celebrated Sideways, keeps life's realities at the core of the film. Humour mixes with pathos, fun with frustration, love with fury, family with business, and nature with human legacy. The Descendants ultimately gets on with what families are meant to do: overcome to the best of their imperfect abilities the most immediate challenge; emerge stronger from the experience; and await the inevitable next test.